Orioles outfielder Adam Jones (left) spoke with Dustin Pedroia during Monday’s game. 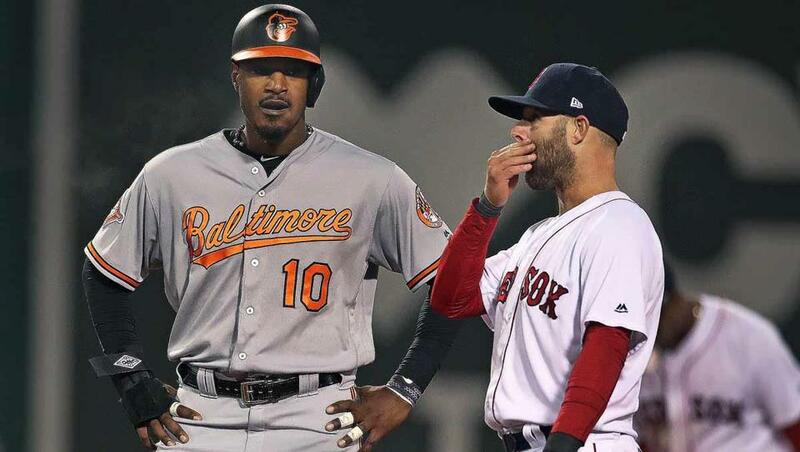 The racial epithets directed at Baltimore Orioles outfielder Adam Jones Monday night at Fenway Park are a “shame on the city” that highlight the continuing need to improve the social environment in Boston, the leader of the Boston chapter of the NAACP said. Sullivan noted that Jones’ experience comes shortly after Saturday Night Live comedian Michael Che called Boston “the most racist city” he has been to. At Fenway, Sullivan said, those who insulted Jones were confident they could freely use hate language because of the attitudes of those around them. Both Boston Mayor Martin J. Walsh and Michelle Wu, president of the Boston City Council, separately denounced the words and actions of the people who harassed the star outfielder Monday. Jones told the Globe that he has been subjected to racial taunts during prior visits to Fenway Park, but his experience Monday was the worst. Wu said in a telephone interview that not only was Jones insulted by the derogatory words, so, too, were all residents of the city and all who support the Boston Red Sox. Red Sox President Sam Kennedy issued a statement Tuesday apologizing to Jones and the Orioles. “Our review of last night’s events is ongoing,’’ Kennedy said. Separately, Governor Charlie Baker used his Twitter account to denounce anyone who used racially offensive words against Jones. In a telephone interview, the leader of the NAACP said she believes law enforcement should identify the individuals and bring criminal hate crime charges if they can. She also called for a lifetime ban on anyone who is identified as the source of a racial epithet not just at Fenway, but at all Major League Baseball parks. Still, he added, the incident involving Jones creates a stain on the city’s reputation nationally. “Nationally, people still think we are the Boston” of the 1970s, when the city was riven by discord after a federal judge ordered the desegregation of the city’s public schools through busing, he said. “An incident of this nature, it only reinforces that negative perception. It doesn’t help us, it hurts us,” he said. Boston City Councilor-at-large Ayanna Pressely called the incident “infuriating, offensive, and disgusting” and called for a more to be done found responsible than simply being ejected from the game. “We need to send a strong message culturally,’’ she said. Maddie Kilgannon can be reached at maddie.kilgannon@globe.com. Follow her on Twitter @MaddieKilgannon. John R. Ellement can be reached at ellement@globe.com. Follow him on Twitter @JREbosglobe.